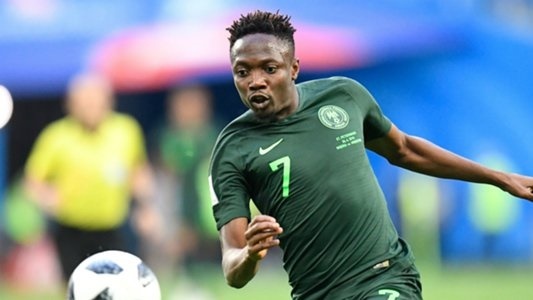 Stand –in skipper Ahmed Musa and 21 other invited Super Eagles have arrived in Uyo, capital of Akwa Ibom State ahead of Saturday’s 2019 Africa Cup of Nations qualifier against the Mediterranean Knights of Libya. The arrivals enabled Coach Gernot Rohr and crew to organize a full training session on Tuesday evening, as the three –time African champions prepare to pluck all three points from the Group E pace –setters. The Mediterranean Knghts top Group E with four points (from their defeat of Seychelles and draw with Libya), while South Africa (winner over Nigeria before they drew with Libya) are second and Nigeria, who lost to South Africa and defeated Seychelles, lie third. The Libyan Football Federation confirmed on Monday that a 54 –man delegation comprising players, technical crew, backroom staff and LFF officials will fly into Ibom International Airport, Uyo aboard a chartered aircraft on Thursday. Match officials from the Democratic Republic of Congo, as well as the referee assessor from Mali and the security officer from South Africa, will arrive in Nigeria on Thursday and then fly to Uyo on Friday morning. Don’t forget to please share this story with your friends and family..